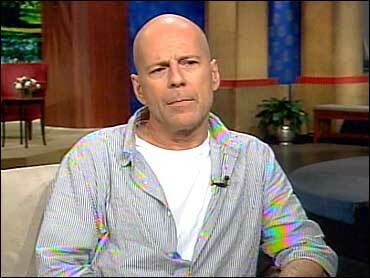 Bruce Willis Wants To "Live Free"
Bruce Willis became one of film's most iconic action heroes when he played New York cop John McClane in 1988's "Die Hard." Now, 12 years after the third installment of the series, he is back in "Live Free or Die Hard," trying to foil a high-tech plot to shut down the entire United States. It's no surprise that the franchise keeps going, the "Die Hard" movies have made more than $1 billion. But Willis said his motivation was the script and the story. "It continued to change," he told The Early Show co-anchor Harry Smith. "It certainly had to be brought into the 21st century, the whole concept of the film. And it has to compete, you know? There's so many films out there that have to compete with TV now. I mean, '24' is a great action TV series — on all the time. That does great big stunts, great big crazy things all the time." Willis, 52, made his film debut opposite Kim Basinger in "Blind Date." Now he is one of Hollywood's most sought after actors. And despite his age, he says he was still able to do many of the stunts the movie required. "It's hard getting up — just as easy to jump out of the car, jump off things. It's the getting up part," he said. Perhaps Willis is just as famous for his family as he is for the movies he has made. He is divorced from actress Demi Moore with whom he has three daughters. Moore, 45, is now married to 29-year-old actor Ashton Kutcher and Willis spends a good deal of time with the couple. "It's really easy. Just put the kids first, you know?" he said. "We just — just hang out with the kids. And that's the job — I mean, you know, grown-ups are — we pretty much, we got it figured out." Willis has also spent a lot of time visiting with Iraq war veterans hospitalized at Walter Reed — men and women he calls the real heroes. "These, you know, men and women who are asked to, you know, sometimes make the ultimate sacrifice, should have films made about them," he said. "They should be taken care of, you know, by the government."